'Studio Ca Mirella' it is a typical Venetian romantic Studio built on the mezzanine floor in the mid 1500 in a really quite atmosphere in one of the last green court of Santa Croce Area near the popular square of 'Santa Margherita'. 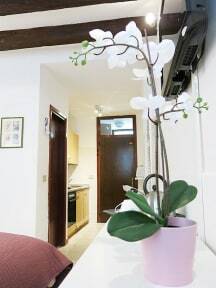 The studio offer the Kitchen Facilities, wifi, self service breakfast including, king size bed, bathroom with shower. The sheets and towels shower including, hair dryer in bathroom, TV, WiFi and kitchen service use. The rural furnishing underlines the warm welcome of Miss Mirella..
We are near the popular square of 'Santa Margherita': University Area. - 2 night's minimum stay so No reduction of price will be made for later arrivals, for earlier departures or changes of room. cancellations have to be made by email.